Me: Jill, you are awesome. 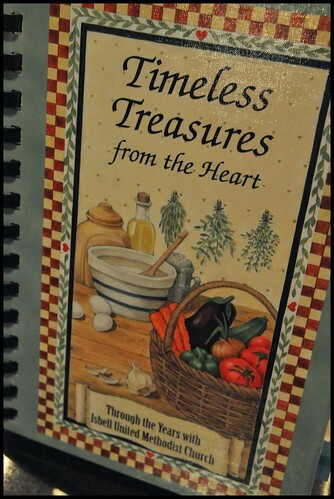 I can’t wait to jump in and start making things from the cookbook. I was sinking into a food rut, which is a bad thing for a food blogger, and this is certain to liven things up in the kitchen. Thank you so much for sharing this with me. You never know when one of these recipes might make its way onto Bon Appetit Hon! Jill: I thought you would like that more than anything else I could have gotten 🙂 plus I felt guilty because I had promised you some southern recipes, so I thought I would just send you a whole boat load at a time! That book should keep you busy. Me: I keep pulling out the cookbook to try and pick something to make. Good lord there’s a lot of butter, condensed milk, cream cheese, sour cream, and venison going on down there. I’m really interested in trying the Faux Frosty…just have to make some room in the freezer for the ice cream maker bowl. Right now it’s stuffed with god knows what. Jill: Yea, just remember that Paula Deen’s idea of more butter in everything isn’t something she just came up with! I’ll be watching to see if anything makes the cut on BAH, althought I would guess that 99.9% of that cookbook is a little too down home for a real foodie. But like I said, there is no such thing as too down home. Unless maybe glands or feet are involved. I’ve got a sneaking suspicion that I’ll be drawn to the sweets in this cookbook more than anything, I’m such a creature of habit. So if you begin to notice a bit of a Southern drawl creeping into things here at BAH, you’ll understand why. I was raised on southern cooking and now when I go back, the cream cheese, sour cream, and condensed milk is shocking! But I guess that’s what makes it taste GOOD! Beth, I had a most unfortunate experience with Paula Deen last night. And let’s just say that not all things cream cheese always taste good. For real, I thought what I mixed up was an unholy aberration of a recipe. Well, bless your heart! I’m sure we all are just a-gonna be lovin’ them recipes! I watchewd Miss paula make a red velvet cake last week. we had dinner at a little restaurant who had a cake dessert bar. red velvet cake is to die for!!!!!! I now embark on yet another San antonio adventure. Oh Emily, sorry that you and the horse didn’t get along so well. Hopefully your red velvet adventure will have a better outcome. At least red velvet cake will not result in a sprained back ! My culinary activity has been curtailed somewhat this last week. good thing she was a short horse! Noxt time I think I will try bull riding! OMG! MY BACK! BTW speaking of glands and body parts……..now butchering is in my family…….STILL…when i went nto the big local farmers marketplace and actually saw beef tongue…….I wimped out. the spouse did note ven get his fried chicken livers that he was dying for…….when i say HOLY COW< I MEAN HOLY COW! The asian market sells all kinds of animal parts but I never get used to the site of them all lined up in the case – tongues, snouts, tails, you name it.